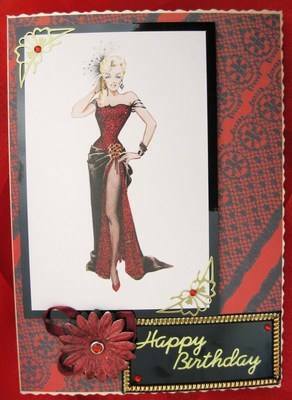 A stunning card 126 x 178mm (5" x 7") with red and black lace patterned background. An image of a movie star in strapless red and black evening dress is matted onto black mirri card and decorated with gold trim and red gems. 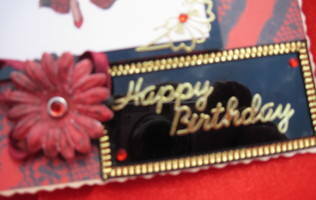 A black panel has Happy Birthday embossed in gold, trimmed with a dark red and black flower. 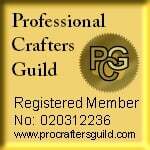 This card is also available without the Happy Birthday box, in which case the fashion panel is placed centrally, as in 'Grace' design.